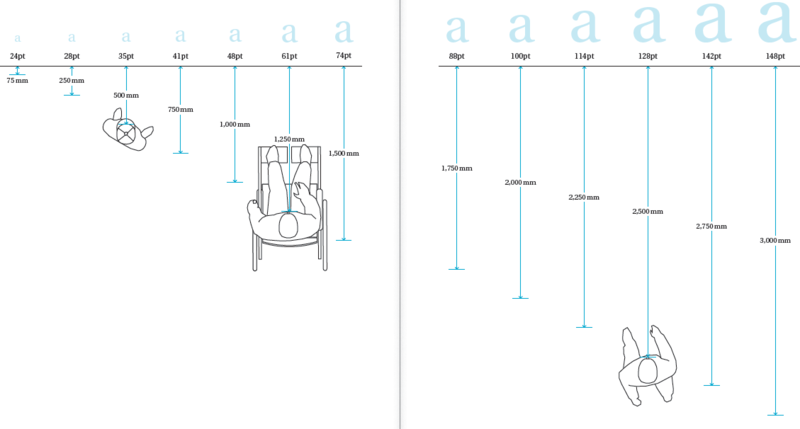 Minimum type sizes are based on probable viewing distance for visitors who are in standing or sitting positions. 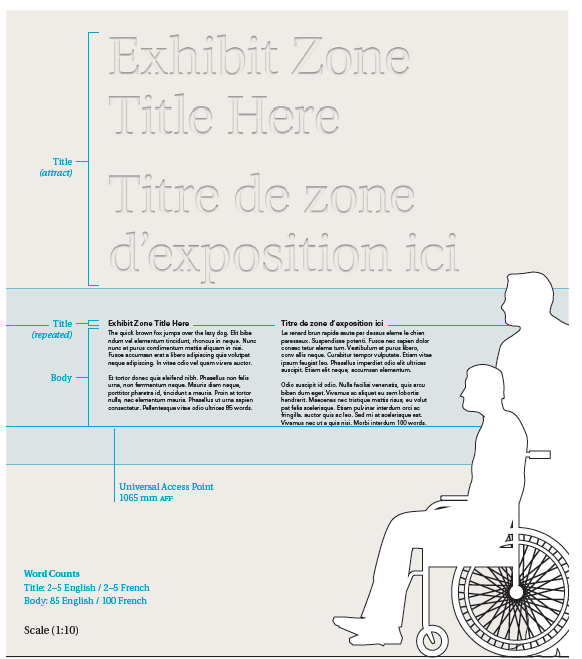 Type size, positioning and angles of built exhibits and text panels meet the standards of legibility for visitors with low vision and for visitors with low vision lines, such as those in wheelchairs (see Figure 5.5.1). The typeface and font size for each stage of the hierarchy is followed consistently and is outlined in Table 1 below. Specific details and examples follow. 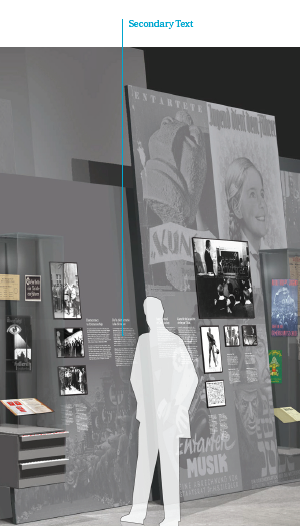 Text walls are an integral part of the overall CMHR experience and complement individual exhibits. 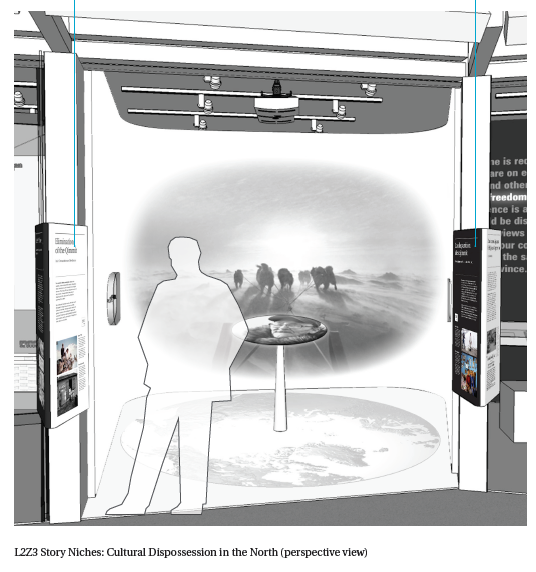 They begin the Museum’s side of a conversation with visitors about the ideas presented in the gallery (see Figure 5.5.3). Text for gallery introductions is composed of a title, which is repeated, and body text (see Figure 5.5.4). 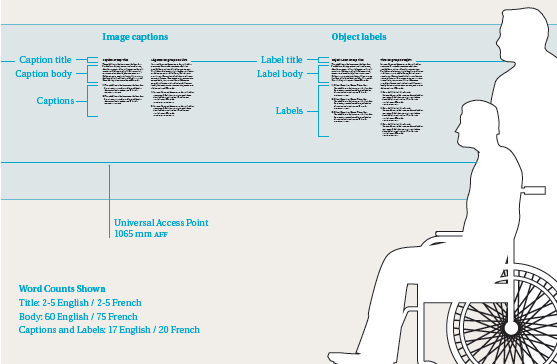 Body text is displayed within our comfortable viewing zone (CVZ), which falls between 890 mm and 1,700 mm above floor finish (AFF) to ensure visibility by visitors who are either seated or standing. UAPs are located at 1,065 mm above the floor (see Figure 5.5.4). Exhibit gallery title text is set at 2-5 words for both English and French and is set in Utopia Regular, 700 pt. 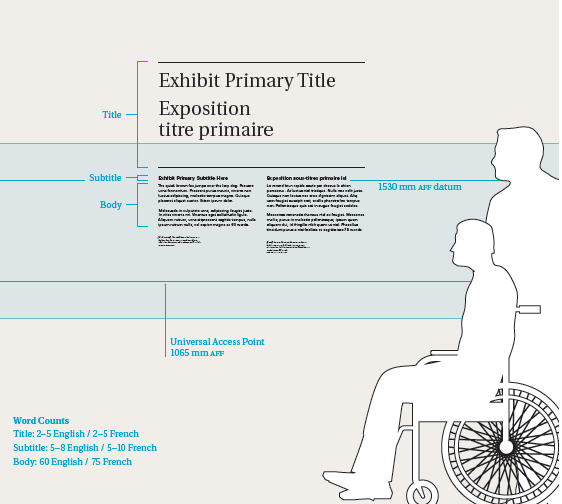 Exhibit gallery title text is consistently stacked, with the English text above the French text, with a clear divider space between the two text chunks. 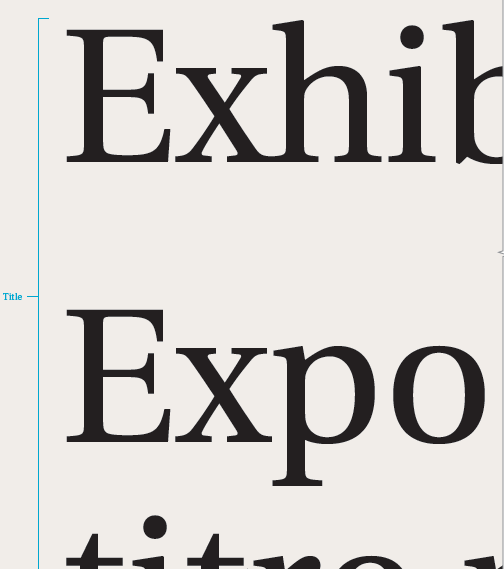 The exhibit gallery title is repeated in Univers Bold, 94 pt and is set directly below the gallery title set in Utopia Regular, 700 pt and directly above the gallery body text (see Figure 5.5.6). This redundancy is important for access reasons. 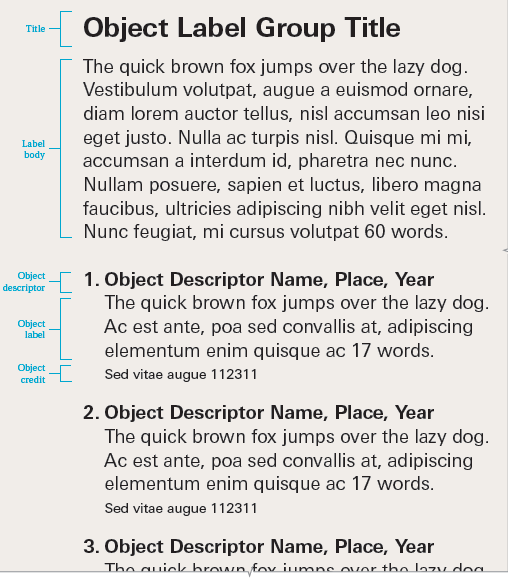 While the title is accessible given the manner in which it is lit, there are many variables that need to align for the title to be accessible, including the reading distance between large and smaller text. 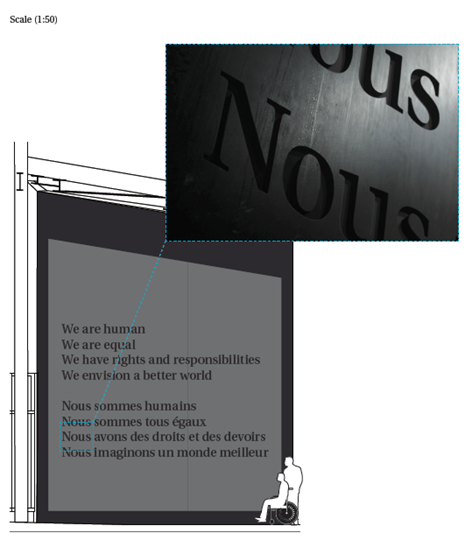 Exhibit gallery body text is set at a maximum of 85 words in English and 100 in French and is set in Univers Regular, 75 pt. 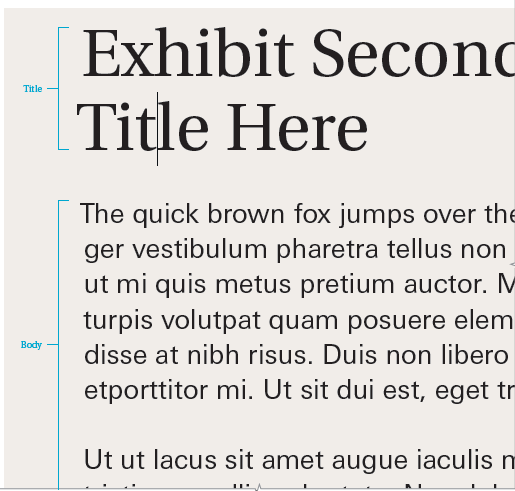 English and French body text is displayed adjacent to each other (see Figure 5.5.7), underneath the second gallery title. 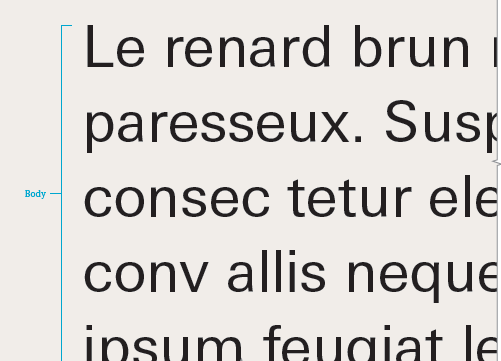 If English and French text cannot be displayed adjacent to each other, text is stacked (see Figure 5.5.8). Exhibit primary text is composed of a title, a subtitle and body text (see Figure 5.5.9). 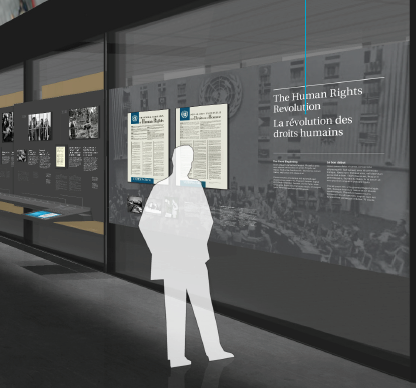 Exhibit primary body text is mounted at 1,530 mm above the floor to ensure visibility by visitors who are either seated or standing. Universal Access Points (UAPs) are located at 1,065 mm above the floor (see Figure 5.5.9). Exhibit primary title text is set at 2-5 words for both English and French and is set in Utopia Regular, 250 pt. 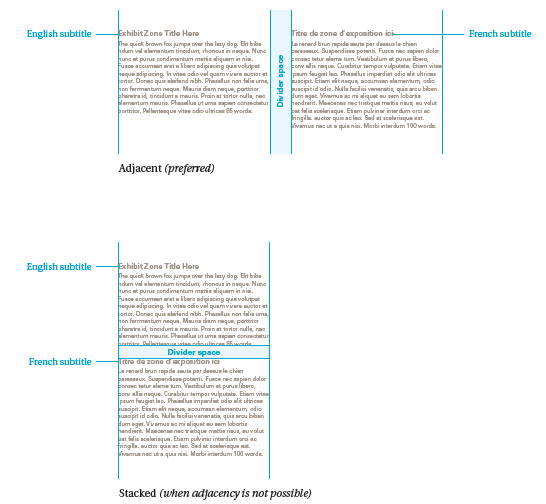 Exhibit primary title text is consistently stacked, with the English text above the French text, with a clear divider space between the two text chunks (see Figure 5.5.10). Exhibit primary subtitle text is set at to 5-8 words in English and 5-10 words in French and is set in Univers Bold, 63 pt. 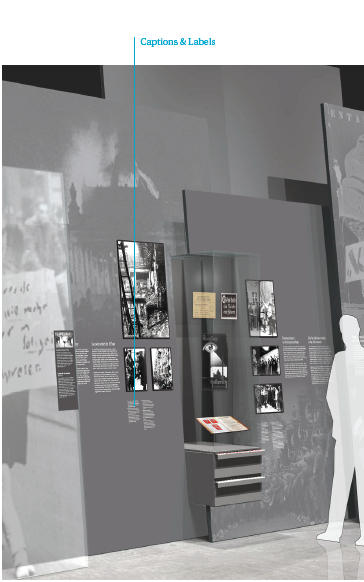 A clear divider space separates the exhibit primary title from the exhibit primary subtitle. Primary subtitle text in English and French are displayed adjacent to each other, with the associated primary body text consistently stacked below (see Figure 5.5.10). 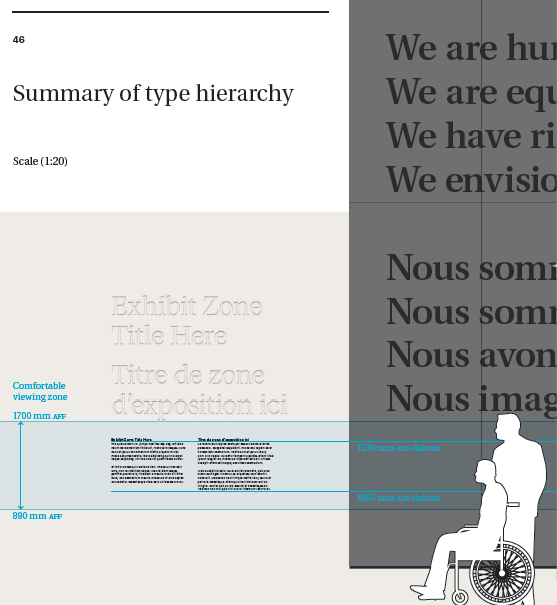 Exhibit primary body text is set at 60 words in English and 75 in French and is set in Univers Regular, 50 pt. There is a clear divider space between paragraphs. English and French primary body text is displayed adjacent to each other (see Figure 5.5.10). If English and French text cannot be displayed adjacent to each other, it is stacked(see Figure 5.5.11). 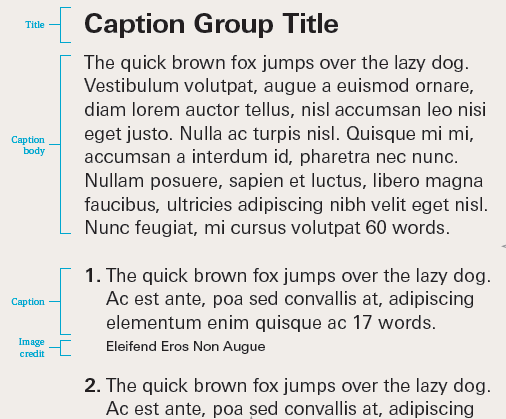 Alcove context panel text and is composed of a title, subtitle, body text, images and captions, and secondary text. 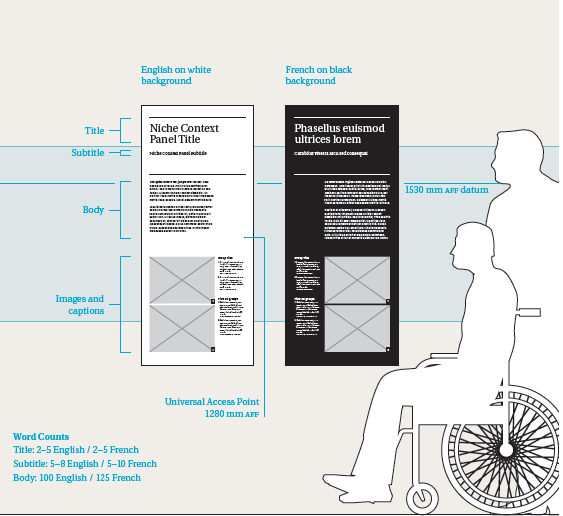 English and French text panels are clearly delineated by panel background: English text appears on a white background and French on a black background (see Figure 5.5.12). 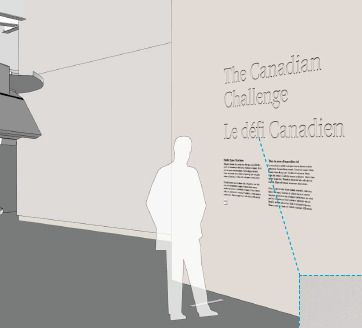 Alcove context panel body text is mounted at 1530 mm above the floor to ensure visibility by visitors who are either seated or standing. Universal Access Points (UAPs) are located at 1,280 mm above the floor (see Figure 5.5.12). Alcove context panel title text is set at 2-5 words in English and in French, in Utopia Regular, 175 pt. A clear divider space separates the alcove context panel title from the alcove context panel subtitle (see Figure 5.5.13). Alcove context panel subtitle text is set at 5-8 words in English and 5-10 words in French, in Univers Bold, 44 pt. A clear divider space separates the alcove context panel subtitle from the alcove context panel body text (see Figure 5.5.13). Alcove context panel body title text is set at 100 words in English and 125 words in French, in Univers Regular, 35 pt. 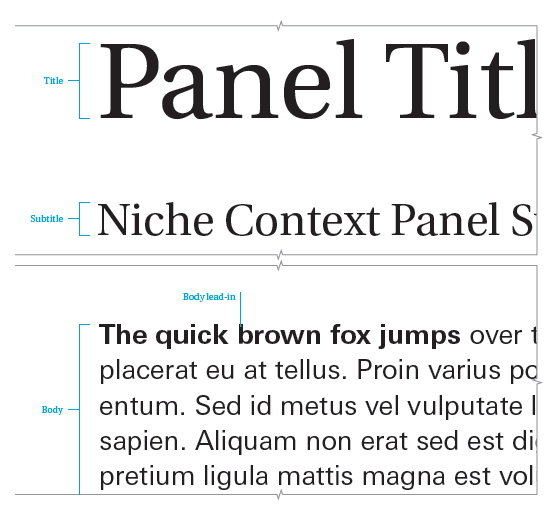 A clear divider space separates the alcove context panel body text from the context panel images and captions (see Figure 5.5.13). Image caption and label text is composed of a title and body text and caption/label text (see Figure 5.5.14). 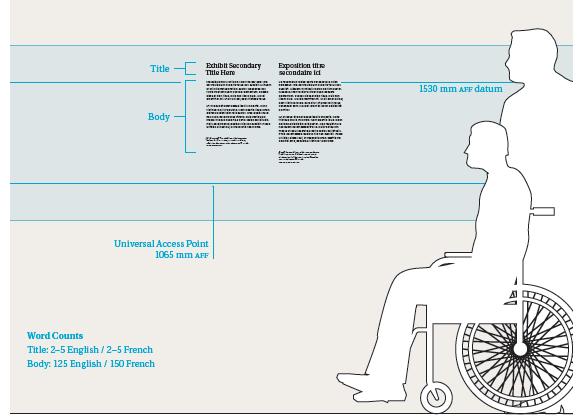 Image caption and label text is mounted at between 890 mm and 1,700 mm above the floor to ensure visibility by visitors who are either seated or standing. Universal Access Points (UAPs) are located at 1,065 mm above the floor (see Figure 5.5.14). Image caption and object label title text is set at 2-5 words in English and in French, in Univers Bold, 30 pt. A clear divider space separates the image caption and object label title text from the image caption and object label body text (see Figure 5.5.15). Image caption and object label body text is set at 60 words in English and 75 words in French and in Univers Regular, 24 pt (see Figure 5.5.15). Image caption and object label text is set at 17 words in English and 20 words in French and in Univers Bold, Univers Regular or Univers Italic, 24 pt (see Figure 5.5.15). Secondary text is composed of a title and body text and appears in both horizontal and vertical format (see Figure 5.5.16). 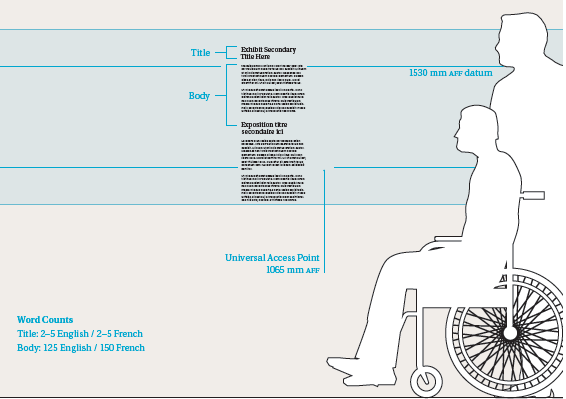 Secondary body text is mounted at 1,530 mm above the floor to ensure visibility by visitors who are either seated or standing. Universal Access Points (UAPs) are located at 1,065 mm above the floor (see Figure 5.5.16). Secondary title text is set at 2-5 words in English and in French, in Utopia Regular, 87 pt. 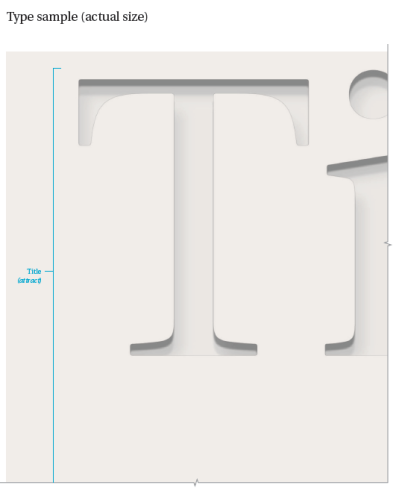 A clear divider space separates the secondary title from the secondary body text (see Figure 5.5.17). Secondary body text is set at 125 words in English and 150 words in French and in Univers Regular, 35 pt (see Figure 5.5.17).